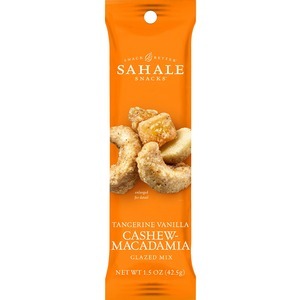 Tangerine vanilla cashew-macadamia glazed mix reimagines the classic combination of smooth vanilla and bright citrus flavors by pairing pure ground, Madagascar vanilla bean and tangerine with crunchy cashews and buttery macadamia nuts. Each bite delivers just the right amount of crunchy, chewy, sweet and salty flavors in perfect little clusters. Dry-roasted cashews and macadamia nuts are perfectly roasted using just hot air to develop sweet notes and a satisfyingly crunchy texture. And best of all, each bag is packaged quickly to preserve all that amazing flavor. Snack mix is perfect for impressing guests, boosting office morale, serving at company meetings and more.